I can be a very VERY stubborn person at times. I sometimes feel like it is my way or the highway. It is a definite flaw of mine. Probably the worst kind of relationship to be in for someone who needs to be in control of their destiny, is with someone in the military. Your relationship involves three entities, you, your significant other, and the military. The simple fact is, you are in love with someone who has committed their life to protecting your country. Serving in the military is no small task, and the needs of the military will always come first. I had never had a career effect a relationship this much in my entire life. I wanted to just break when I found out he was deploying and our relationship was still new. I didn't know how to effectively cope with all the unknowns from the military. Instead, I learned how to bend. I did not know anything about the military, the army or what the army can offer to spouses. After signing up for Army Family Team Building courses and volunteering on post, I felt more confident and proud to be a military spouse. I felt that the knowledge I had not only helped me handle military life better, but also an asset to newer spouses. I used to think affirmations were a bit ridiculous. One of my AFTB teachers had mentioned that she said at least three affirmations every night. I didn't think they would work until an unexpected emergency forced me to fly home within less than 24 hours of getting bad news. I am TERRIFIED of flying and did not have the time to mentally prepare myself for the flight. That night I told myself over and over before going to bed, "You will get on that plane. You will be okay." I have never felt more motivated to get on a plane in my life when I woke up the next day. I say them almost every night now. When my nerves get built up I go to the gym. I usually blast angry music and lift the heaviest weights I can then I run like a turtle going through a pile of peanut butter. You may like yoga, dancing, walking, angry cleaning (I'm very jealous), zumba, etc. etc. whatever it is it is scientifically proven to help your mental state and put you in a better mood. Simply exercising gives me clarity on any situation. Sometimes simply talking about the stressors of military relationships can help make you feel stronger, calmer and overall happier. 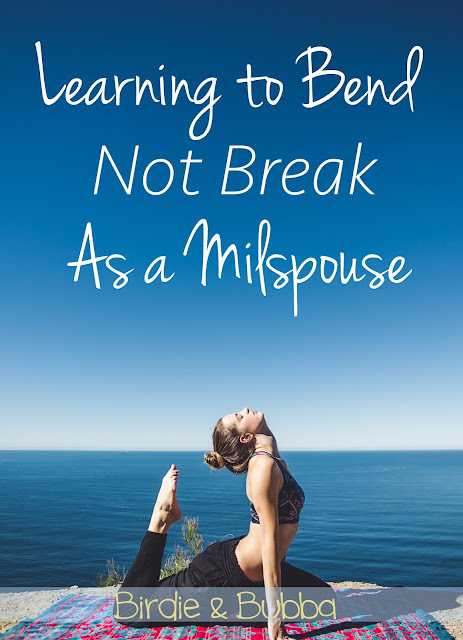 Girlfriends are great people to simply vent to once in a while but if you feel that you need to speak to a professional the military has many resources for your family. Military Family Life Counselors are available at most if not all military bases in the United States and OCONUS (outside continental United States). They are able to provide non medical, short-term counseling free of charge to military members and their families. **If you need are having suicidal thoughts, are being abused or if your require medical counseling services your MFLC can refer you to the proper resources to provide the appropriate treatment through TriCare and Victim Advocate if needed. I love the quote "Sometimes, the only thing you can change is how you react." I don't think there is any other quote that accurately describes military life. I found that changing how I thought or simply thinking before I act has made military life A LOT easier. I encourage you to try these ideas for yourself and being to notice the positive changes in your life.